If content marketing predictions made by leaders like Joe Pulizzi, Sarah Mitchell, Carlos Abler, and several others are any indication, 2016 could truly be the year when brands finally start to de-silo their content efforts and operate as fully functional publishers. This means it’s time to significantly ramp up your content capabilities – or acquire them from other companies – if you don’t want to fall far below the competition when it comes to engaging with today’s tech-savvy and social media-sophisticated consumers. Regardless of whether your business is looking to build or buy your content marketing expertise, setting yourself up for greater success will take dedication, determination – and an enterprise-wide view of every piece of content you produce. Fortunately, the processes don’t need to be overwhelming if you have the right tools and guidance on hand. When it comes to creating successful content marketing initiatives, I’ve found that most of the tasks can be divided into four key areas (with a bit of overlap here and there): thinking, planning, doing, and improving. With this in mind, I’ve compiled a DIY tool kit of checklists, templates, and resources that can help make running your content marketing program a lot more manageable. In this strategy development phase, your business must determine why and for whom it’s creating content and what goals it will achieve. It’s also the phase where you elicit the stakeholder support you need to position your content marketing program for optimal success. The DIY tool: This checklist provides a concise overview of the key factors you will need to consider as you develop – or refresh – your content marketing program. Getting buy-in: A lot of moving parts need to be tended if you want to run a well-oiled content marketing machine. But there’s one barrier in particular that is sure to throw a monkey wrench into the works if you don’t attack it head-on: lack of executive support. 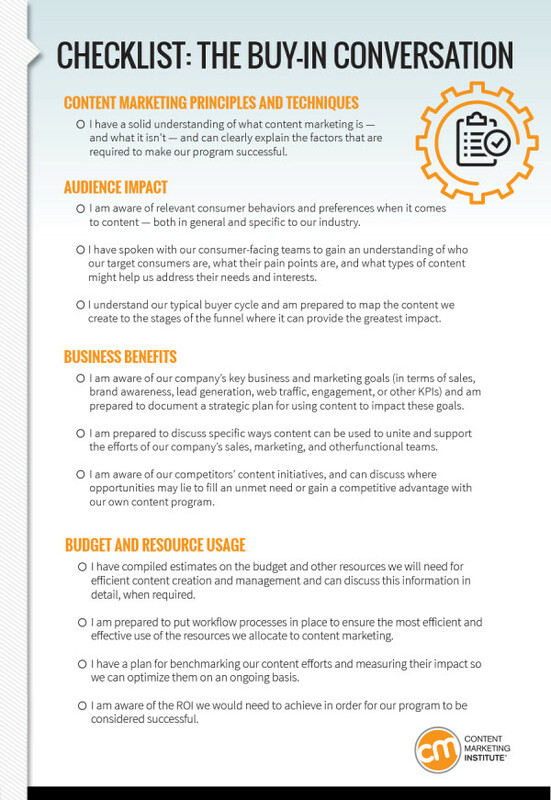 The DIY tool: The following checklist can help you prepare a compelling case and assure stakeholders that your content marketing program will be well positioned to reach its goals. Get everything you need to master the buy-in conversation in CMI’s Essential Starter Kit. Building a strategy: According to our 2016 Benchmarks, Budgets, and Trends research, 53% of the most effective content marketers have a documented strategy. A strategic road map is essential for enterprise content initiatives, as it helps everyone in your organization understand the opportunities and challenges involved, prioritize projects, and execute on each effort with a shared purpose in mind. 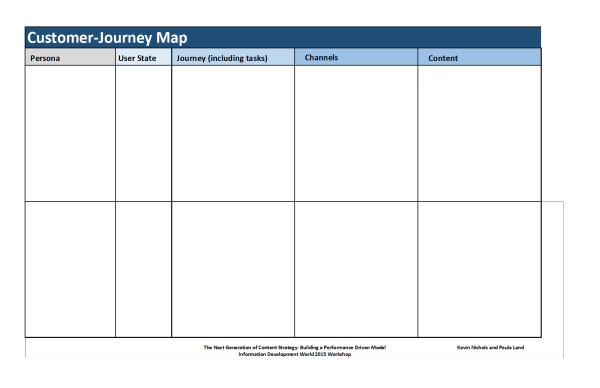 The DIY tool: While there’s no one-size-fits-all template for developing a strategic road map, this guide to the essentials of a documented content marketing strategy will walk you through all the issues you should be prepared to address. 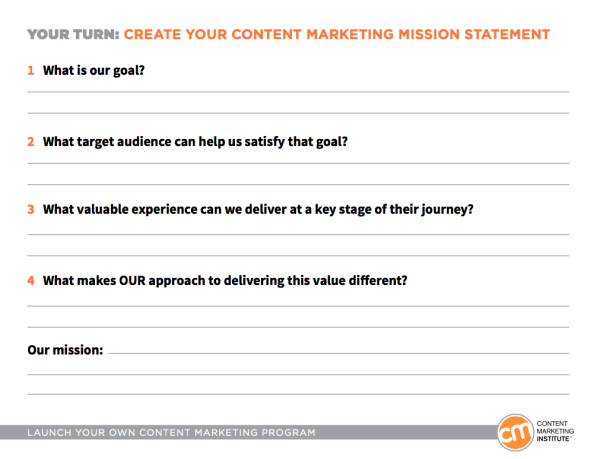 Developing a mission statement: A content marketing mission is an outline of a company’s reason for creating content, and the priorities and perspectives it will uphold in pursuit of that mission. As it helps to define the unique content marketing value your business provides, it’s a critical component for governing your content creation efforts and keeping them focused on your business goals. 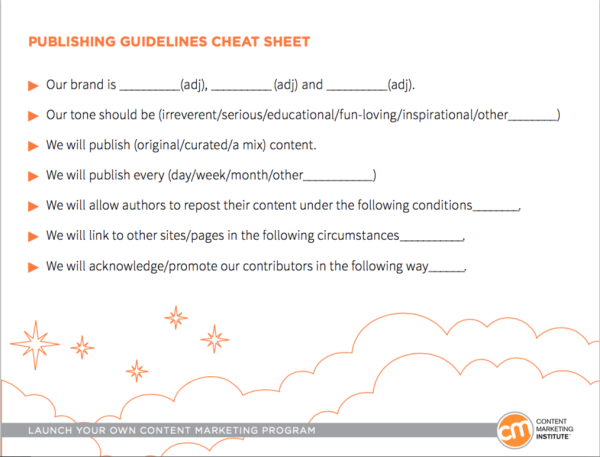 The DIY tool: Use this worksheet (created as part of CMI’s workbook on launching a content marketing program from the ground up) to hone in on the key components that should comprise your organization’s unique content marketing mission. Building audience personas: A buyer persona is a composite sketch of a key segment of your audience; it characterizes who they are, what their relevant needs are, and what role they are likely to play in the purchasing process. Without personas to guide your decisions, you are more likely to revert to creating content around what you know best (your products and company) instead of around the information your audience is actively seeking. The DIY tool: This guide will walk you through everything you need to create easy, yet actionable, content marketing personas. Mapping it all out: Once you determine your mission, target audience, strategic goals, and objectives, the next step is to build a framework that defines how your organization will use content to achieve them. The DIY tool: The step-by-step process outlined in this post by Brain Traffic’s Meghan Casey will show you how this is done. I call this phase the “reality bridge,” as it describes the actions necessary to take your content marketing program from its existence as a lofty strategic ideal to its realization as a fully functional and productive content marketing engine. Building the framework for your content plan: Repeat after me: Content marketing works best when you plan for its success. Mapping key considerations, such as your topics and ideas, procedural guidelines, workflow processes, and channel priorities before you start to write will make it much easier to keep the high-quality content flowing smoothly, and overcome any unexpected challenges that may arise. 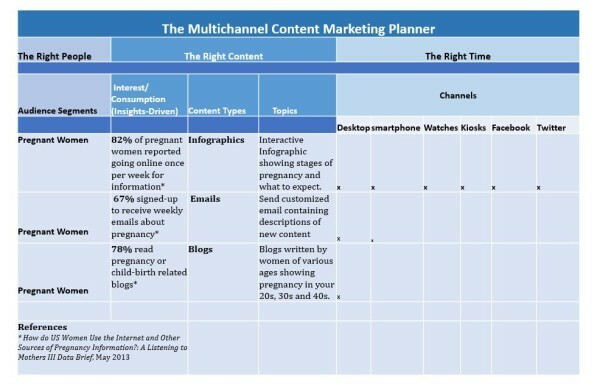 The DIY tool: Not only does this road map template from Michael Brenner address the essentials of a solid content marketing plan, it can also help you account for specific details that are relevant to your company’s unique business case – like team resources, topics, and key performance indicators. Identifying your customers’ journey: Providing your audience with a rewarding experience is the whole point of content marketing. So it’s essential to understand their consumption preferences, engagement habits, and pain points – as well as how those needs may change over time – if you expect your content to deliver the kind of value that will help you forge deeper customer relationships. 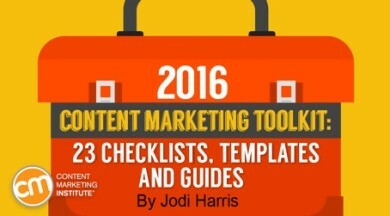 Learn how to develop the most efficient, scalable content marketing strategy possible. Register to attend the 2016 Intelligent Content Conference. Aligning content ideas with business goals: If you want your content to reach the right people at the right time, on the right channels, and drive them to take action, you need accurate audience data to inform your publishing plans, as well as the specific content ideas you execute. The DIY tool: This multichannel content marketing planner, created by strategy expert Lisa Copeland, is an easy-to-use, easy-to-share way to capture the data and data-related insights that lead to a strategically aligned content creation. Structuring your team resources: Because there are just so many moving parts to effective content marketing creation and distribution, it’s imperative that everyone involved knows who is responsible for each task and that all the most essential tasks are being accounted for in your content marketing process. The DIY tool: Joe Pulizzi has outlined 10 content marketing roles he believes every brand will need to fill if it wants its initiatives to be successful. Need to hire for any of these roles within your organization? Look for candidates who can bring these essential skills to the table. Establishing your editorial guidelines: At a minimum, your editorial content plan should outline the defining characteristics of your brand identity (as it relates to the content you will publish), the preferred voice and style of your content, and the editorial standards governing your content efforts. The DIY tool: Use the publishing guidelines cheat sheet below to determine and document this information. Setting your editorial calendar: This most steady and stalwart of tools in the content marketer’s arsenal has transformed itself over the years, from a simple spreadsheet for tracking what we publish to an essential component for managing the entire life cycle of our organization’s content marketing program. The DIY tool: The CMI team uses a multi-tabbed spreadsheet that’s based on the editorial calendar template below to keep our content ideas organized from conception to completion. Click the image below to download your own copy, which you can customize to your team’s specific content needs (go to “File > Download As >” and select the format you would like). Creating your channel plan: This component of your editorial plan governs how, when, and on what specific platforms you will publish content, as well as any rules of engagement that your organization would like to set for interacting on those channels. 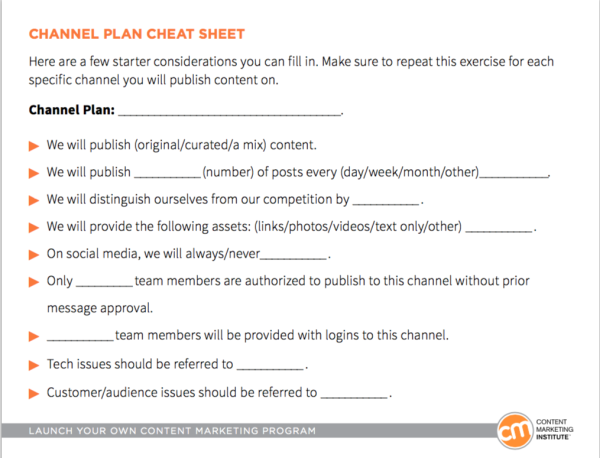 The DIY tool: Fill in this cheat sheet for each channel you plan to leverage in your content marketing initiatives. Once you’ve set your strategy and outlined your plans for executing it, it’s time to start creating those compelling, customer-driven stories that will help you reach that content castle in the sky. Though the creative process is unique to every business, plenty of tools can help with generating story ideas, organizing them into relevant content pieces, and sharing them with a target audience. Brainstorming ideas: Team brainstorming sessions are a great tool for getting the creative juices flowing and coming up with new ideas for content creation. The DIY tool: Follow this simple, seven-step sticky-note-based process outlined in this post by Jay Acunzo for more productive content marketing brainstorms. Prioritizing your productivity: Not every suggested idea will be a good fit for your content marketing strategy. Some others may be fantastic on paper but require more time and resources than your team can spare. When these situations arise, it helps to have a process for determining which projects are urgent, as well as for handling essential go/no-go decisions. 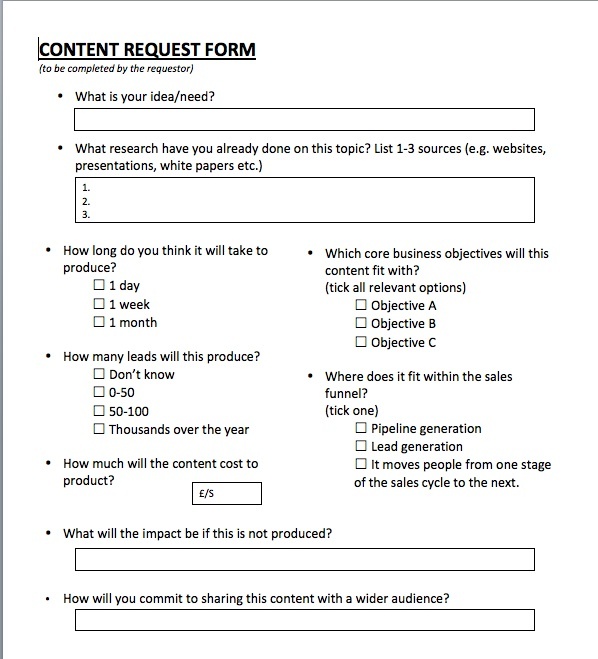 The DIY tool: Use a content request form like the one below to help your content team prioritize their own projects – and manage the expectations of external teams that rely on them for content creation assistance. Managing your ongoing progress: The more you blog, the more you need a simple, scalable way to track your previous blog posts and plan your future blog content. 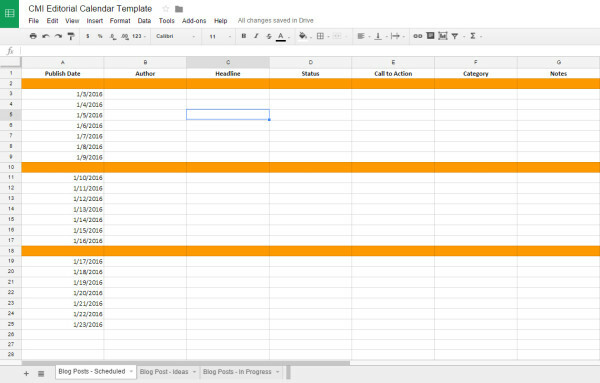 The DIY tool: Follow the three-step post-tracking process shared by Roger C. Parker to help you streamline and scale your content creation efforts. Curating content: Curation is a great way to maximize your content resources and get the most value out of every piece of content you publish. However, it can be challenging to ensure that you are discovering, producing, and sharing the right information to make a positive impact on your target audience. The DIY tool: Use this scorecard created by Roger C. Parker to gauge the quality and consistency of your content curation efforts over time and to make sure you are staying on the right track. 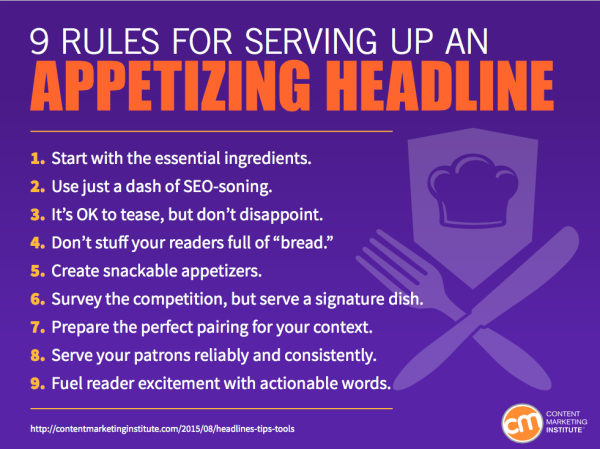 Crafting compelling headlines: Headline writing may just be the most difficult part of content creation. Headlines need to grab attention, but should be clear, relevant, and understandable, so readers find exactly what they expect when they choose to engage with your content. The DIY tool: This checklist, from our guide on cooking up a killer headline, outlines the rules every content creator should follow, along with some suggestions for spicing up your efforts once you’ve mastered the basics. Listening to your community: It’s one thing to create content that you think your audience will like; but the one true way to gauge the impact your content is having on your audience is to listen to the conversations they are having on social media about your business. The DIY tool: Use this content review template created by James Prideaux to track relevant social media conversations and document any analysis extracted from your listening activities. These tasks help you maintain, strengthen, and grow your content kingdom by identifying what’s working (and fixing what isn’t), enhancing the value and impact of your efforts, and amplifying your content’s power through strategic promotion and optimization techniques. Maximizing the value of your platforms: These days, it seems like there’s a hot, new content platform hitting the scene before the buzz has even started to cool on the last one. But that doesn’t mean content marketers need to start publishing here, there, and everywhere to make an impact. Instead, your business may be better served by optimizing the content you are already publishing on established channels, like SlideShare, LinkedIn, or your blog. The DIY tool: If you are looking to expand your use of the SlideShare channel or are looking to get stronger results from the content you publish there, this e-book of SlideShare secrets can help you stack the decks in your favor. Promoting content: Content marketing promotion can take many forms, such as sharing your published content on your social channels, enlisting the assistance of industry influencers, incorporating native advertising and other paid media opportunities, or leveraging other non-obvious promotion techniques. The DIY tool: If a blog post gets published in a vast, crowded landscape, will the right audience be able to find it? Perhaps. But your chances will be significantly improved if you follow this checklist from Mike Murray, which features over 50 tips for marketing your blog content. Optimizing for search engines: Optimizing your content marketing for search can feel like a game of Clue – a process of trial and error where you may encounter a lot of false starts and dead ends before finding the right path to success. But there are more strategic ways to plan and manage your SEO efforts so that your content draws in your target audience and delivers the value they are looking for. 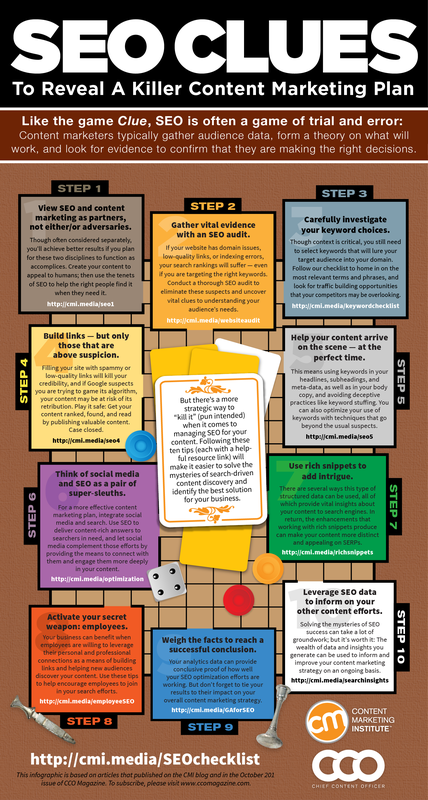 The DIY tool: Following the 10 steps outlined in this SEO Clues infographic – as well as the additional tips that Tracy Gold offers in her ultimate SEO checklist – will make it easier to solve the mysteries of search-driven content discovery and improve your rankings for relevant searches. Measuring success: Your content is only as good as its ability to support your marketing and business goals. It’s not enough to just create and distribute the content you think your audience needs. You must also track and evaluate its performance on an ongoing basis. The DIY tool: Follow the simple plan outlined by CMI’s Marketing Director, Cathy McPhillips, for measuring content marketing effectiveness – including her KPI tracker template and a list of common goals and their associated metrics. While these tips, tools, and templates will help you start tackling many of the challenges involved in successful content marketing, they are no substitute for a thorough understanding of the principles and techniques they represent. If you have questions, or would like additional insights on any of these topics, let us know what information you are looking for by adding a comment. 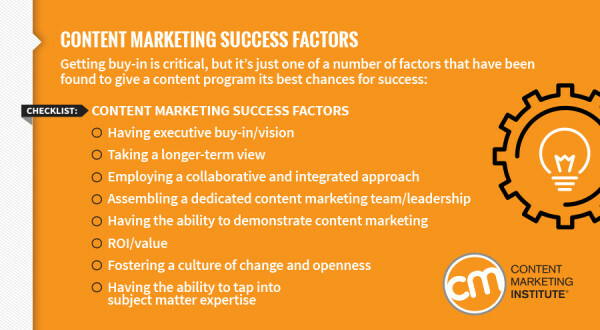 Get a detailed overview of the five principles that content marketing success is dependent on. Read our 2016 Content Marketing Framework: 5 Building Blocks for Profitable, Scalable Operations.